I love a good sandwich. I am always on the go so the fact that sandwiches are compact and easy to take to the beach, park and backyard is very appealing to me. The first time I went to Vietnam on business, I had the Vietnamese Sandwich and loved it. 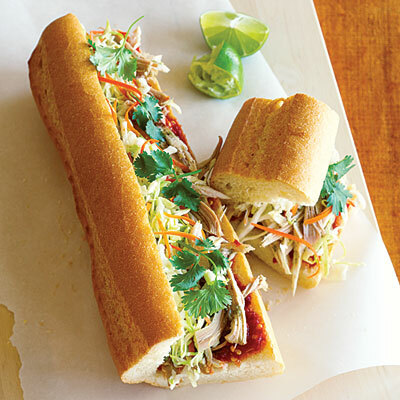 I thought they made this sandwich for foreign visitors, when in fact it was foreign influence that made this Vietnamese sandwich (after all the French were there for 100 years). The French bread in Siagon is so good!!! I also love using fresh vegetables in my sandwiches. Summer gives us great tomatoes, cucumbers, sprouts, lettuces and much more. Be creative and add (fresh or prepared) pesto and vegetables to your next turkey sandwich you will love the results, and it is so easy. Meanwhile, make the seasoned pork: Heat the oil in small nonstick skillet over medium heat. Add the onion and cook, stirring, until soft. Add the pork, seasoning, garlic, and pepper and cook, stirring, until just cooked through, about 2 to 3 minutes. Remove the heat and set aside covered with foil to keep warm. Make the sandwiches: Preheat oven to 400 degrees F. Slice the baguettes open lengthwise, and slather the insides with mayonnaise. Arrange the baguettes on a baking sheet and bake until hot and crusty about 5 minutes. Remove the baguettes from the oven and immediately fill each with some of the seasoned pork. In each sandwich, arrange 2 slices each of the pork roll and salami, 1 teaspoon soy sauce, 1/2 tablespoon cilantro, 1 slice cucumber, ground pepper, and chili oil, if using. Serve immediately with the slaw on the side. Fresh Tomatoes are the best! 1. Prepare a grill for medium heat (350° to 450°). Combine 1 tbsp. oil and the garlic and brush onto 1 side of bread. 2. Lay bread oiled side down on grill and cook until slightly toasted, about 2 minutes. 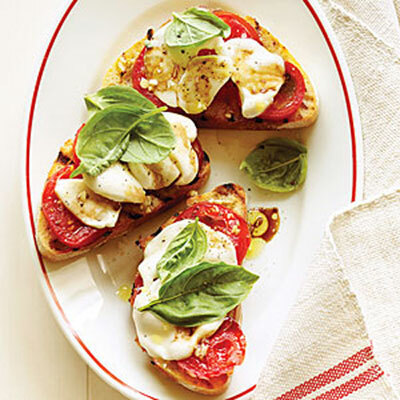 Turn bread over, lay tomato slices on bread to fit, overlapping if needed, then lay cheese slices over tomatoes. Cover grill and cook until cheese starts to melt, about 4 minutes. 3. Transfer sandwiches to a platter. 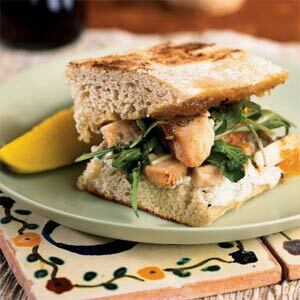 Put 2 basil leaves over each sandwich and drizzle with remaining 1 tbsp. oil and the vinegar. Sprinkle with salt and pepper. Spread jam over cut side of top half of bread. Combine cheese, bacon and butter in a bowl, stirring until smooth. Spread cheese mixture over cut side of bottom half of bread. Arrange chicken evenly over cheese mixture; sprinkle with pepper. Place top half of bread, jam side down, over chicken. Heat a large nonstick skillet over medium heat, and add sandwich to pan. Place a heavy cast-iron skillet on sandwich; cook 5 minutes or until both sides are browned, turning once. Place arugula in a bowl. Drizzle dressing over arugula; toss gently. Remove top bread half from sandwich. Arrange arugula mixture over chicken. Replace top bread half. Cut sandwich into 4 equal portions. 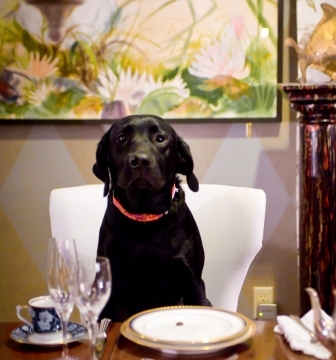 Our CEO Coco loves sandwiches too! I hope you are enjoying summer! Now is the time to pack up the family and some of these sandwiches and get outside! Picnic season will be over before you know it! If you liked this post or if you like our blog please comment and click the follow button. Thank you for reading and being a part of Celia Bedilia’s world! My mouth is literally watering! Thanks so much for the inspiration, there’s nothing like a great sandwich on a picnic! I am LOVING this post!! !